Tapjoy’s newest Maximum Impact Report revealed users who watched 20+ videos in their first two weeks doubled their average sessions over the next 30 days. In case you missed our latest Maximum Impact Report, the data shows that rewarded videos bring a whole lot more value to mobile apps beyond the direct revenue they generate. There’s the profound impact on in-app spend, which, as we detailed in part one of our blog series, increases by as much as 8x for users who watch a lot of rewarded videos. And then there’s the impact on retention, which we’ll describe in a future blog post. 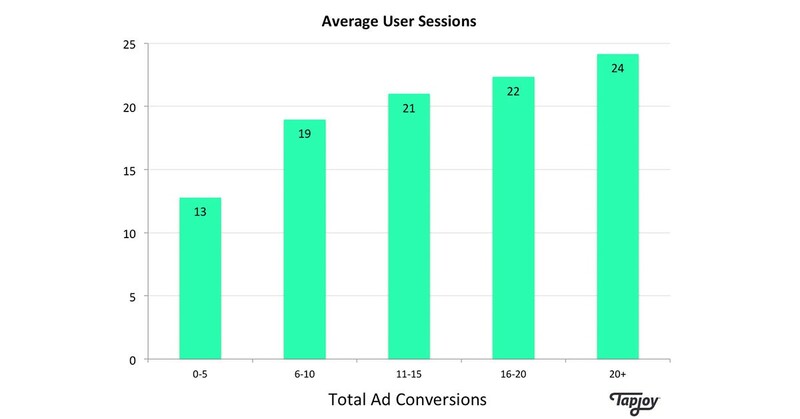 But for now, let’s examine the effect rewarded ads have on user sessions and overall engagement. To quickly recap, our Maximum Impact Report examines the question, “Do users become more (or less) valuable to app publishers as they complete more ads?” To find the answers, we looked at millions of users across ten high-volume apps. After first cohorting users based on the number of rewarded ads they completed during their initial two weeks, we then measured their average performance for in-app spend, user sessions and 30-day retention during the following 30 days. Just as with the other two metrics, we found that the more rewarded advertisements a mobile app user completes, the higher their engagement metrics climb. According to our data, users who watched five rewarded videos or less came back for an average of 13 app sessions over the next 30 days — an average of nearly one session for every two days. That’s not bad, but the sessions go up 46 percent when users move into the next cohort and watch between six and ten rewarded videos. The number of sessions goes up again with the next cohort, and in fact with every cohort group we studied, indicating a strong correlation between the number of rewarded videos a user watches and the number of app sessions they participate in. The average increase across all cohort groups was 18 percent. The highest group of ad consumers, those who watched 20 or more videos in their first two weeks, wound up conducting an average of 24 sessions over the next 30 days. That’s nearly double as many as those who only watched 0–5 video ads! The reason for such a high correlation is likely a matter of causation. Players who watch rewarded videos gain currency to spend or premium items to use in their favorite apps. They are then more likely to come back and open those apps in order to spend the currency or use the premium items they earned. The currency and items then lead to a better, more exciting user experience, which in turn leads them to come back again, and so on in a virtuous cycle. To drive higher user engagement, it is important to expose users to ads early and often. Our new Maximum Impact Report provides more details on eight suggested best practices to maximize rewarded ad engagement, so be sure download the full report for more!